Our first day of hiking in the Douro valley involved hiking from our hotel in Pinhão, up the Pinhão river valley, climbing out of the valley to the village of São Cristovão do Douro, then further climbing up to the ridge to the scenic town of Provesende, and then returning to the Pinhão river valley through the town of Vilarinho de São Romão to eventually end up in Celeirós at Quinta do Portal, one of the area’s larger wineries. 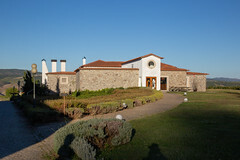 In addition to operating the winery itself, in their attached vineyard Quinta do Portal runs two different guest houses (Casa das Pipas, the “House of Pipes”, and Casa do lagar, a former olive pressing house), a restaurant, and tours of the winery and cellars. Casa das Pipas itself is quite a nice, inviting guest house, literally in the middle of the vineyards (the vines come all the way up to the swimming pool), and with our reservations in the room came quite a few amenities: free tours of the Quinta, a discount on purchased wine and olive oil, packed picnic lunches each day, and, most importantly of all, dinner. For odd reasons having to do with logistics on our trip, we were actually spending four consecutive nights at Casa das Pipas, either with our hiking taking us on a round trip, or having an arranged taxi shuttle us from our hike’s endpoint back to the Casa. When we arrived, we had an interesting conversation with our host selection our dinner time. We learned that in the pantheon of national quirks and stereotype; while Americans tend to be rather early diners, apparently we aren’t as over-eager for our supper as the Dutch, while apparently Brazilians are renowned for keeping the waitstaff going well past midnight. In the end, we ended up selecting a traditional Portuguese dinner time. So every evening at 9pm, after some time relaxing by the pool with wine, we’d clean up a bit, and walk from the guest house through the vineyard to the main restaurant next to the winery. 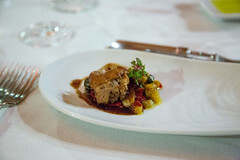 Each evening, we were treated to a nominal 4 course meal, usually an amuse bouche, an appetizer with soup, a main course, and a dessert, each paired with one of Quinta do Portal’s wines. Instead of writing up each meal individually, I was going to summarize some of the dishes we had during our stay, calling out some highlights. To start off each meal, we’d be welcomed with a lighter drink, usually white port with a sliver of lemon in it. 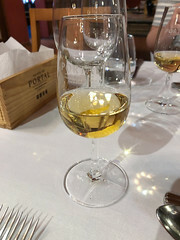 Before this particular trip to Portugal, I’d only rarely had white port, and it’s actually grown on me quite a bit; it makes for a pleasant, muscatel-like aperitif, and as I learned over the next few days, also works well as a port-and-tonic cocktail to sip by the pool. Each meal would then start with a simple “couvert”; a selection of bread, some olive oil, and a small single-bit appetizer (what in a French-style restaurant I’d call an “amuse bouche”). For our various meals, we had a simple oxtail stuffed with chicken, a ceviche, suckling pig, or mini cones cones with cheese, red pepper, and vanilla. All of these were enjoyable, but I probably got the best enjoyment out of the lightly-cured and tender ceviche, and the suckling pig which was a very nicely roasted morsel of pork with a nice wild mushroom and beet purée (the latter being a common ingredient of several dishes; Quinta do Portal does have some good kitchen efficiencies). 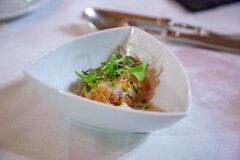 Next up was the formal appetizer, slightly larger than the couvert. Over our stay, this included an empada de vitela (veal puff), bolinhos de bacalhau (fried fritters of salted cod), polvo (octopus), couscous, bolinhas do Alheira (sausage fritters covered with sesame). All of these were nicely executed. Ones we enjoyed being the bolinhos de bacalhau; well-executed fritters of soft and juicy salted cod with a crispy exterior; we’d have this dish several times in Portugal, and this version was basically perfection, and they were paired with a very pleasant Colheita white wine that balanced the slight saltiness of the bacalhau quite well. The bolinhas do Alheira were well-receieved as well; a pleasant, spicy pork sausage rolled in sesame to make a compact but flavorful fritter, here the paired wine being the house Rosé, which was a particularly nice, slightly sweet pairing that worked well (as an aside, several of the places we stayed had particularly cheap or complimentary bottles of Rosé available, and I’ve gained a fair appreciation for that style of wine as a lighter wine choice). 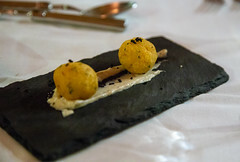 But the star here was the polvo com pure de pastinaca, octopus with parsnip purée, served along with the bolinhos de bacalhau. I’ve had a lot of octopus. I’m usually not a fan. 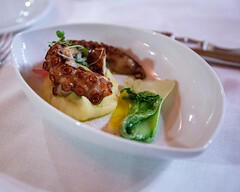 But this was perfectly seasoned and cooked, a tender bit of octopus nicely coupled with a good puree. Indeed, probably the best octopus I’ve ever had. Following the appetizer was a soup course. 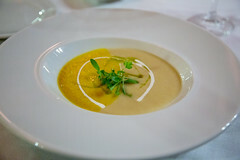 All of the soups we had were a variation on a simple cream soup, with the different nights’ offerings ranging from cauliflower the first night, the next night being a duo of carrot and cauliflower soup, then pea soup the third night, and then mushroom soup. While lacking a bit in variety (indeed, we had the cauliflower soup twice), these made up for it in execution; each of these was a perfectly executed, smooth, and flavorful soup, with our favorites probably being the mushroom soup and the carrot/cauliflower duo (I always enjoy “mixed” soups like this where I can dabble with different combinations). The main course followed, and they seem to follow a nice rotation fish, meat, and poultry, our four meals ranged from veal, to sea bass, to duck, to salmon, each served as a fairly generous portion with a side of vegetables. One favorite of ours were probably the sea bass, which was served up fried, with them spooning the hot cooking oil over the skin to crisp it up. 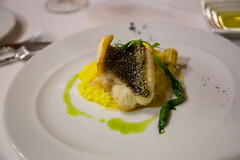 The fish itself was perfectly cooked, and the skin, while starting to curl, had an absolutely sublime subtle crispiness to it. Served up with a citrus sauce and saffron creamy rice, with a nice Tinta Barroca wine, this was a very pleasant main course. 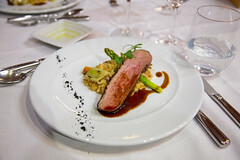 Another favorite was the Pieto de pato com o seu arroz cremosa (Duck breast with creamy rissoto and asparagus). A very nicely done duck breast, perfectly medium rare, tender, and flavorful, combining perfectly with the creamy risotta. Served up with their reserve Tinto, this was the perfect combination of duck and red wine. 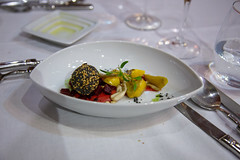 Finally, each evening had a different interesting take on dessert, with each evening’s selection ranging from a chocolate parfait (with a port wine sauce, of course), a bread pudding, a banana cake, or the interesting Abobora em Diferentes Texturas (“Pumpkin in different shapes”). 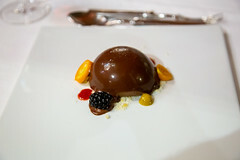 Of these, one favorite was the chocolate parfait: a smooth, creamy parfait including a bit of port, a crunchy internal cookie layer, a perfect encapsulating robe of chocolate, and a selection. Adding in a glass of the Quinta’s “29 Grapes” Port, and this was a particularly pleasant dessert. 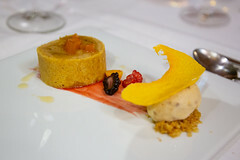 The “Pumpkin in different shapes” was also a favorite; while starting to come into “Pumpkin spice everything” season back in the States, the Portuguese use of pumpkins is distinctly less spiced, and the result was four different types of pumpkin, all tasty: pumpkin bread, a pumpkin puree, pumpkin ice cream (more fruity than spicy), and dried pumpkin. Served up with a Muscatel instead of Port, this made for an enjoyable pairing and a nice variation of the “Port and Chocolate” theme commonly encountered through our trip. While the “culinary exploration” part of me thought it a bit odd to spend four nights in a row dining at the same place, after four nights staying at Casa das Pipas, in several ways we were sad to move on. The combination of the accommodations, pool, wine, and excellent food made for a very pleasant stay, and a nice way to relax after each long day of hiking. Indeed, if I found myself back in the Douro region, especially if I had a car, I’d certainly enjoy having another stay at Casa das Pipas and enjoying their hospitality. 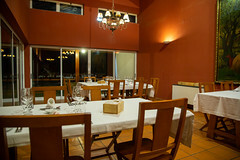 Chef Milton Ferreira is running a very pleasant restaurant at Quinta do Portal, and his menu does a rather nice job showing local cuisine (both contemporary and traditional) and highlighting Quinta do Portal’s wines. And heck, compared to many of my other vacations, Quinta do Portal was also a good, affordable option (since our stay was booked through Portugal Green Walks, I don’t know the direct cost, but can see from various booking services that a half-board stay like ours usually runs under 100 euro per night). It’s definitely a regional gem.